In this July 12, 2017, file photo, a U.S. Customs and Border Protection facial recognition device is ready to scan another passenger at a United Airlines gate at George Bush Intercontinental Airport in Houston. The face scan expansion is costing the Orlando airport authority $4 million. 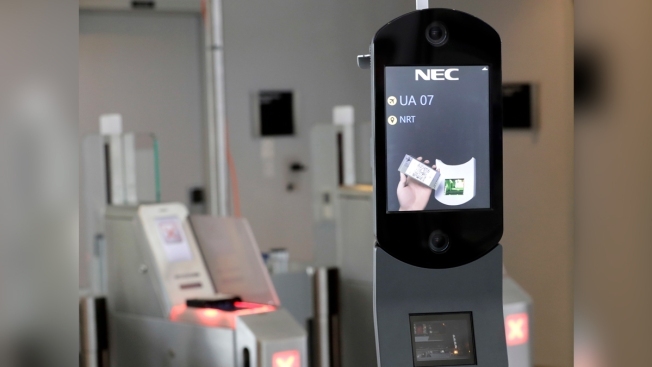 Face scans for arrivals and departures should be fully in place by the end of the year. Florida's busiest airport will be the first in the nation to require a face scan of passengers on all arriving and departing international flights, officials said Thursday, a move that pleases airport executives but worries privacy advocates. "We're comparing you against a photograph you've given the U.S. government for the purposes of travel," Wagner said. "You know your picture is being taken. You're standing in front of a camera. There's nothing subversive about this, and we're only comparing you against your passport photo." "It was fine, efficient, very fast," said Katrina Poulsen, a Denmark resident who arrived in Orlando on a flight from London.